I'll now post my long-awaited review of "STK irrLicht" progress, with a few screenshots. First, let's take a look at the main menu screen. 'Race', 'Options', 'Help' and 'Quit'. Visually the green hover circle animation (yes, it's a small animation) is too glossy, and the STK developers would like some ideas/contribs on hover. Most of the icons will probably be replaced too, so contributions are highly welcome. Everything, but some graphical change is still needed. But as a show-off it's certainly interesting, as it shows how track selection might be in 0.7. Notice the small arrows which will later lead to more tracks, as well as the different tabs at the bottom. 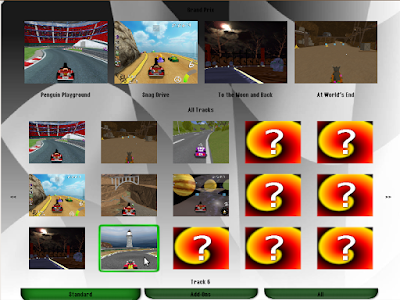 The kart selection screen also got tabs to deal with different kart groups. Driving around, items, nitro and playing with gamepad. Not too much to see yet - I guess some of you may be disappointed by the looks, but remember changing from PLib to irrLicht isn't done in a day. The developers know how much is missing, and they are working at their own pace to make STK 0.7 better than - not worse than - SuperTuxKart 0.6.1a. Regarding the "burning trees", it's only a bug caused by trying to implement explosions - quite a rare sight! One of the funniest looking bugs at the moment. And by the way; "works" means that it kind of works, though it's not in a finished state. * Lots of work also happened in the input module; someone who'd never been able to play STK using his gamepad reported that all worked fine in the new branch. Also, input configurations will no longer be tied to a specific player, which means you can play sometimes with gamepad, sometimes with keyboard, and don't have to reconfigure everytime like in 0.6. Last but not all, 0.7 will be able to tell which gamepad model you're using, which means you can use a different configuration for different gamepad models. 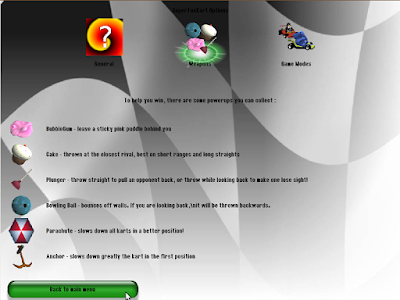 Note: As the irrLicht branch is still in a very unstable state, the general public is recommended to use the last stable version (0.6.1a) of SuperTuxKart. I have to say that I did get a little disapointed by the last image, but I also trust you when you say it's going to be improved, and I really like the interface screenshots!!! Gallaecio - we shouldn't expect to much from 0.7, because at this stage they are rewriting everything to irrLicht. This is hardest part, but after that part is finished, there surely will be room for improvements in future versions. Or am i wrong? Do you plan to enhance graphic in 0.7? @ Anonymous: As Auria says, you're quite right regarding the race graphics, but a new GUI is a big leap on the visual side IMO. Support for animations in-race is also being worked on, but as you say the next versions will probably be more focused on making the actual models. Still, this depends on the amount of contributions. Unbelievable! It looks awesome! I tell you awesome! Keep up the great work! Hmm ... it looks good, but: How do I "click" on icons? 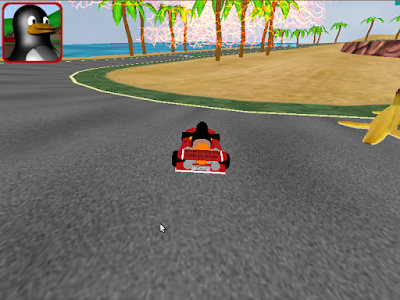 I have tried to build supertuxkart-irrlicht, but it doesn't react to inputs (I cannot even select anything), neither to gamepads nor to mouse nor to keyboard-actions. You should post this on the mailing-list instead, and you would get more accurate answers if you include more details as well. I love new GUIs too. Hello to the administrator of this page, I'm not English but I like your game especially Supertuxkart version 0.8.1. I wanted to say that I need help deny that is to say I have slightly modified version 0.8.1, the problem is that I need to change the interface in this version as in previous (0.6.1 and 0.6.2), can you give me a tutorial or example please it's urgent because I really like your game. thank you.